oh these cold and dark December days! these happy things of mine could equally read, my four survival things! Oh boy, early nights, tucked up cosy, head on pretty pillows and a good read! not much swinging from the chandeliers going on here! 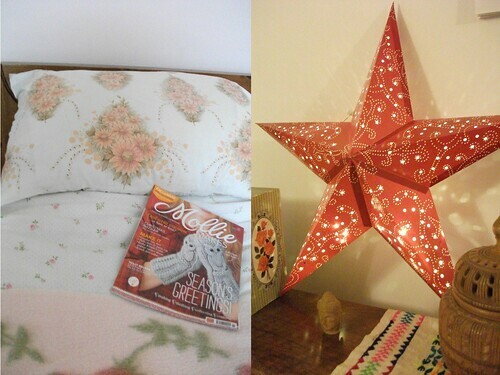 My advent star in the evenings, casts a pretty glow, adding some magic. 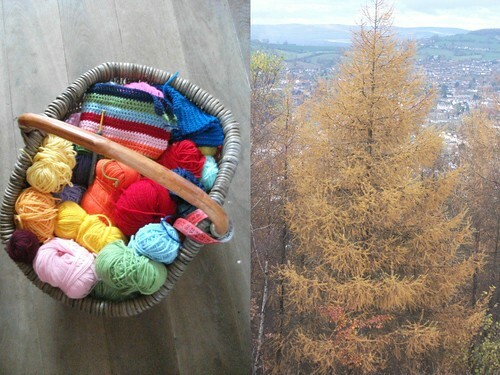 A colour hit from my wool basket, there's lots of elving going on at the moment. 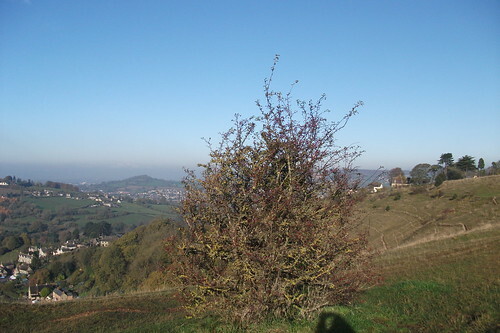 and of course the view above my home town. I go up here almost everyday. It sure is cold. We wrap up and stomp along the top of the common, taking it all in. The wind blows out all the cobwebs! The fir trees have turned spectacular colours. Then it's back home to the warm to make coffee! 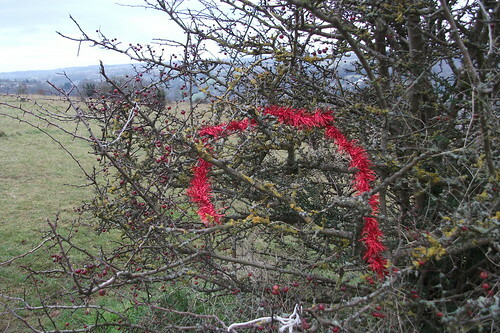 This Hawthorne tree, (picture taken a few weeks ago), will become the local dog walkers christmas tree! Over the next few weeks it will gradually get decorated with tinsel and baubles and cards and photos of peoples dogs! and a box is left underneath for donations of food and money, which goes to the local dogs home. It's a sweet idea and it has become quite a landmark! Yesterday I found the first piece of tinsel. I love the red! I'll show you more as time goes on. Thank you for a great response to the give-away, if you haven't already entered you have until midnight on the 14th! U.K. time! on this post here. Have a super cosy and fun weekend! what a great tradition!!! i'm happy to see the gradual decorations adding!!! I love your red star too! That is a GORGEOUS red star, I love it... and that tree... just looking at and walking by that tree would make me happy, the bits that people put on it, how awesome is that? Love the idea of the dog walkers tree, how utterly gorgeous.